Thank you Beddy’s for sponsoring this post, as always all thoughts and opinions are 100% my own. Izzy’s in a big girl bed and she LOVES it! But she’s not the only one. My husband and I love it too. If she’s sick, sad, scared or anything really, we can just lay in bed with her. 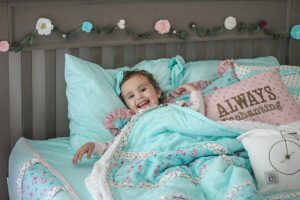 Flash back to Izzy transitioning from a crib to a toddler bed. 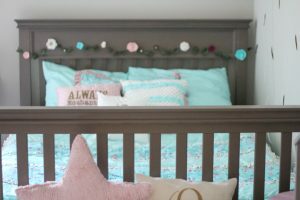 She did really well and honestly laying with her in the toddler bed was as comfortable as laying with her in the crib… because it’s the same bed, just a crib rail vs a toddler rail. I hated squeezing into that tiny thing and I thought, you know what.. we are working on potty training, let’s tell Izzy she’s getting a big girl bed since she’s been going on the potty like a big girl. So the reasons we decided to put Izzy in a big bed was to encourage her to be a “big girl” and make tending to her needs if sick or upset easier on us. 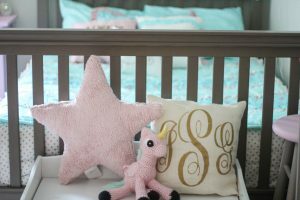 So here are tips for easy transition to a big girl/boy bed. I’m obsessed with this bedding! I was so sick of sneaking in Izzy’s room late night to re-cover her with the blanket and worry about her being too hot or cold. I love how Beddy’s stays attached at the bottom for Izzy to easily pull it up and down. 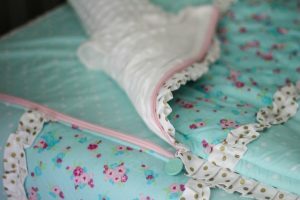 It does also have the option to unzip at the bottom for kids who like their blanket unattached. Plus that feature makes for easy cleaning. I also love this bedding because it allows Izzy to help make her bed. It’s super easy for her to pull up the covers and zip it up. She loves being a “big girl” and having big girl tasks. 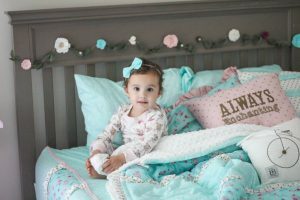 We can’t live without our DockATot and if you have a toddler who is in a bed without rails this is a great way to keep them in the bed. 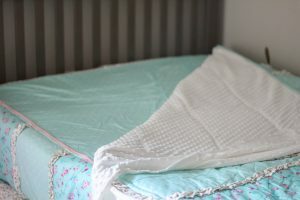 They have multiple styles for covers so you will find one to match your child’s bedding. The DockATot is definitely a must in my book. You already knew this if you have been following the blog for a while. 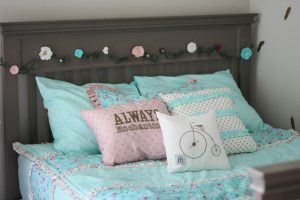 Tie the space and bedding together with little accent pillows or garland. 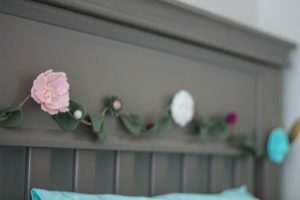 We picked accent pillows from Beddy’s and had custom flower garland created to match the bedding. 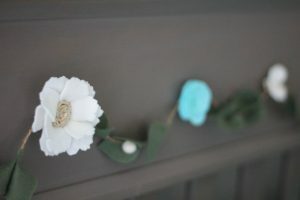 If you are flower garland or headband obsessed, we got ours from Heart Strong Boutique. The photos below of these tiny detailed flowers will wow you! A Little Pillow Company makes the perfect size pillow for your little toddler’s head. Plus it fits perfectly in the Dock A Tot. We got 2 covers to go with the pillow so we could easily wash one while she uses the other. Lastly but certainly not least, the mattress is very important. Thinking about not only what Izzy will be laying on, but I will be too if she’s scared in the night or even sick. We have a mattress from Tomorrow on our bed so naturally we wanted the same mattress for Izzy so we can all sleep comfortably and soundly.. no matter what bed we are in. If you are interested, we got the medium soft hybrid mattress. When zipped up the bed looks so put together! It’s so easy to make that Izzy can even help. There is a soft minky inside that she loves and says and very cozy. Plus the edge of the minky hang longer for extra coverage when unzipped. 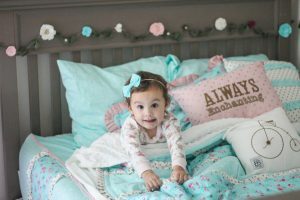 Have you transitioned your toddler to a bigger bed? Do you have any tips on what made it easier for you? 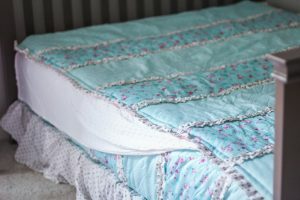 Have you tried Beddy’s yet? I love all the decor! It’s so pretty! 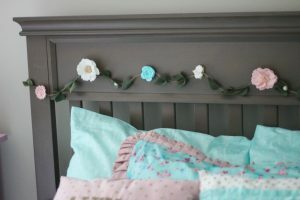 Especially that garland! 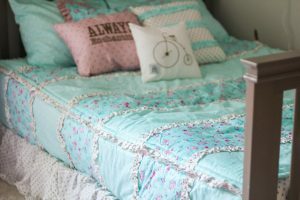 Beautiful bedding! I love the zipper idea! Aww she is such a big girl now! 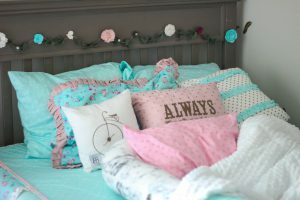 Love her cute bedding! Thank you! She’s loving her bed! My sons have Beddys Bedding-love it! 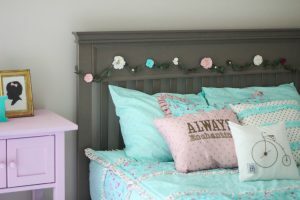 Lover her big girl room- it’s precious! I love all the details! So cute. That bedding is so cute!! And I need to check out this Little Pillow company! 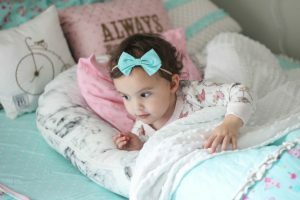 Alright, I definitely have to get Beddy’s for both of my kids! I’m going to check them out right now, thanks for the tip!